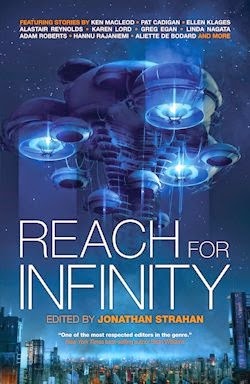 Anthologist extraordinaire Jonathan Strahan presents an extraordinary assemblage of hard science fiction stories in Reach for Infinity, the latest phase of a great undertaking that started with a simple idea six years ago and has gone from strength to strength since. In the conceptual stages, its successor was to tell "the story of how humanity might actually climb out of its own gravity well, if it could, and begin to make its way out onto the broader stage that could be seen in Edge of Infinity." 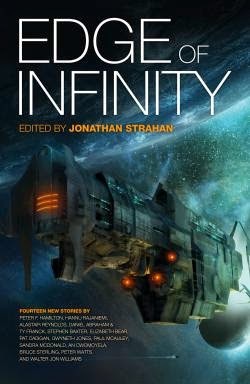 (p.12) But as the short fiction started rolling in, Reach for Infinity "became a collection of stories about striving, reaching for that next elusive state in the development of each world created by the writers who took part." 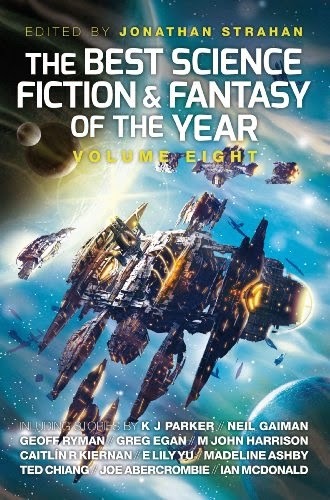 (p.12) Writers who represent an array of the greatest creators working in the industry today. Reach for Infinity gets off to a fantastic start with a selection of shorts that set expectations accordingly high, beginning with 'Break My Fall' by Greg Egan, in which a caravan of starships travelling to Mars by slingshotting around an ingenious series of so-called Stepping Stones must take shelter from a solar storm. It's an optimistic affair, if not so soaring as 'The Dust Queen' by Aliette de Bodard—another of the author's award-winning Xuya universe stories—which has a rewirer called Quynh Ha hired to help an almost mythical mother figure find peace among her many memories. Bleak as 'The Dust Queen' seems, it, too, culminates on a hopeful note. Ian McDonald's contribution tends, conversely, towards the depressing. It's about a pair of new moon workers, Achi and Adriana, who find comfort in this alien place in one another's company, only to learn that their time together is strictly limited. 'The Fifth Dragon' flies back and forth between their first days as a pair and their final moments as friends, underscoring that the end of everything is inevitable. It's a real revelation to be reminded what McDonald is capable of outside of the perfectly pleasant but eminently forgettable Everness novels. Whatever Luna is, it can't come soon enough, in truth. 'Kheldyu' by Karl Schroeder is the first of a few fictions in Reach For Infinity that sits strangely in the larger context of the anthology. Sent to secure a solar updraft plant is the Siberian forest, Gennady Malianov—a recurring character of the author's who arrives at a realisation over the story's course—suspects there's more to his employer's project than meets the eye: an agenda that could devastate the earth instead of saving it. There are of course more things in infinity to reach for than the stars—there's the environment; there are artistic achievements and advances in life-saving science—but 'Kheldyu,' as well as Adam Roberts' legal history of 'Trademark Bugs' and Ken MacLeod's 'The Entire Immense Superstructure: An Installation,' struck me as stretches in Strahan's selection; three solid hard science fiction snippets that stand to answer different questions than the rest. Following Schroeder's story, Pat Cadigan's gets the anthology back on track. 'Report Concerning the Presence of Sea Horses on Mars' revolves around Rose and Beau, Martian migrants who have to answer to the American government when the economy on Earth goes into freefall and the Powers That Be start sniffing around the facility in Feenixity. This one's a little difficult to get into, but the end result is rewarding. 'Hiraeth: A Tragedy in Four Acts' revolves around a young man fitted with a cyborg eye before such adaptations become commonplace in a society struggling with a medical condition which essentially represents homesickness. Karen Lord's exploration of this idea is as deft and sensitive as ever, so though this is one of the tiniest tales in the text, its impact is more than a match as regards the larger narratives. Same goes for the other short stories punctuating this lengthy collection's many novelettes, namely 'Amicae Aeternum' by Ellen Klages, a bittersweet bit about the bucket list of a girl about to leave earth on a generation ship—the random has rarely seemed so special—and 'Invisible Planets,' in which Hannu Rajaniemi documents a darkship's dreams in a narrative that reminded this reader of 'The Bookmaking Habits of Select Species' by Ken Liu. In 'Attitude' by Linda Nagata, the construction of a space station is sponsored by a sport known as Attitude. Juliet Alo is a popular player who becomes convinced there's corruption in the ranks. Then, the aged narrator of 'Wilder Still, the Stars' adopts an artificial daughter in an attempt to understand whether these perfect people are people at all. 'In Babelsberg' by Alastair Reynolds is brilliant, if a bit silly: Vincent is a celebrity space probe interviewed over the course of a story equal parts satire and science fiction by a baby and a hilariously dangerous dinosaur. A story on the opposite end of the seriousness spectrum rounds out Reach for Infinity: 'Hotshot' by Peter Watts tells the tale of Sunday, a girl born and raised to travel to the red planet, but keen on her freedom. 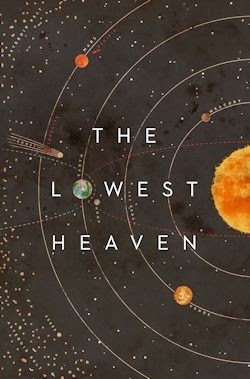 All in all, I'd be hard pressed to identify a single story that doesn't satisfy the high standards set by Engineering Infinity and its superlative successor, though a few, I'm afraid, don't gel terribly well with the other authors' efforts to conceptualise humanity's first fumbling steps into the stars. From its modest origins, The Infinity Project "has evolved into an attempt to map how science fiction can address tomorrow, how we can respond to science itself, and how we might be able to retain an element of romance and optimism, without sacrificing the kind of realistic assessment our collective future needs from science fiction in the 21st century," (p.13) and in this, Reach for Infinity succeeds, such that I can hardly wait to see where Jonathan Strahan's continuing chronicle of the future history of humanity heads next. It's an excellent, anthology on the story selection and arrangement level, absolutely. Top notch stories, here.